Does this fix antivirus-related crashes? The game constantly freezes on levels 3-1 and 1-3. I’m using Bitdefender. Hi there! No, this wouldn’t fix anti-virus related crashes. I’m surprised there aren’t already any fixes out there. Interesting – I’ve sent you an email to see if we can figure it out. Thanks! Hi, so i’m having some stuttering problems. They are definitely not due to my hardware, as I have no stuttering with any of my other games (GTAV runs fine, for example). I have used the 4GB patch tool and still have stuttering whenever more than 4 or so enemies are on screen at once. The first village area with the cop on the cross, stutters to a crawl. Any help would be appreciated. Thank you and keep up the phenomenal work, I can’t wait to see the finished project! Did you experience similar issues before installing the Village Texture Pack? I am grateful to play the village HD texture produced by you , but I always experience shutting down of the game at exiting the gate of 2-3 (battle just after the village head). It did not happened before I install the HDTEX. So would you please help me to solve this problem? Thanks for your help. Hi there! Can you confirm whether you’ve applied the 4GB Patch tool (mentioned above) to the exe file? Still, great work on the project as a whole! Too bad you couldn’t finish in time for me to beat RE 0,1,2 and 3! 😛 Playing my way through the whole series. On 4 now. Hi Ian – In your last comment you mentioned that installing the 4GB patch made your copy of the game not be able to start. I asked if you were using a genuine copy of the game because we’ve seen that the 4GB patch makes pirated / repacked versions of the game crash at startup. Can you confirm that you’re using a genuine copy of the game AND that you’ve applied the 4GB patch? Thank you! Thanks for reaching out. What is the file size of the file you downloaded from us? Do I just drag and drop the 4gb patch into the bin32 folder? Those 0’s are zeros btw. Game won’t run at all now that I tried patching it. We have noticed that the 4GB patch makes pirated versions of the game crash. Are you using a genuine copy of the game? Technically it’s genuine just not legally purchased. I can only see a white screen but i hear game sounds like the menue and stuff. So the game is running but my screen is just white. Did you experience that issue before installing our texture patch? before installing the texture pack the game runs normally. I did not changed anything in the options. I just started the game and then i quitted again to install the texture pack. looking forward for your help, thx a lot! Could you check if 44000120.pack and 44000100.pack files are inside Resident Evil 4\BIO4\ImagePackHD folder? I’m assuming you followed the “Windows 10 users” instructions. Am I right? Let’s see if we can find the root of the problem! The files you told me to check are in the named folder. Yes i installed it as instructed. Meanwhile i deinstalled RE4 and installed it again. And without installing the texture pack, the screen turns white immediately after starting the game. So it might be a problem with the game itself. It´s just funny because the first time i started RE4, it ran normally. Hi. This is really a great job you have got here. However, I’ve got the same problem as William Adkins below. I downloaded village HD texture pack, and there is no bat file. Hey, i’ve been having some crashing problems, so I downloaded your fix and used it on bio4.exe. Unfortunately, now it is giving me this error code when I attempt to launch the application: “The applications was unable to start correctly (0xc0000142). Click OK to close the application.” I’ve tried running in administrator mode, and it produces the same effect. Any help would be great! Did you experience the crashes before installing our texture pack? Hello RE4 HD Project team. I’m having this same problem! I was already in Salazar’s Castle. I’ve payed the village part with the textures pack just fine and whien i got at the castle, I saved the game and downloaded the castle’s texture and the crash fix tool. I don’t know whhat to do! Please help me. The game is beautiful btw, great job! Unfortunately it botches with Prophet’s cracked version of the game. The work you both have done is top-notch. I’m slowly moving through the castle checking everything. Very, very cool. Beautiful stuff. I’ve run into a slight issue; the game is continuing to freeze at a particular spot in the game, everytime without fail. The area of the game concerned is section 3-3-Cage Dropping/hour-glass-in-chest room. Whenever I try and exit the room through the progress-door, the game drops. I plan to erase the game, and do a fresh install. My question is regarding the location of save files. I’d like to pick-up where I left off. Thanks for taking an amazing game and giving it new life! Both of the files listed above appear to be in their proper folders. Could that have anything to do with the issue as the game should be in C:\Program Files (x86) ??? Hummm I don’t think the path was a problem. If it was, the entire castle pack shouldn’t be properly installed and this is not the case. Please, let us know if you find the file and if you are able to solve the issue! Hey guys! Your mod is phenomenal, but I’m experiencing a bug now. I just finished the Village, which worked flawlessly and now entered the castle section. So I’m fighting the cultist enemies for the first time and for some reason that enemy type has no sound? Was wondering if the texture pack might have somehow affected that. Could you tell us in which room and which enemies exactly suffer that bug? I’ve also got this problem. It’s the cultist enemies in black costumes whom you first encounter in the castle level (right after the bridge, and they are very popular) don’t make any sound at all, even when shooting at ’em or that unique sound they usually make (boo-boo-ah-be-be or something like that). It’s kinda missing after I install your patch. That seems to be the only problem I’ve got with your patch. Pretty impressive work I must say. Thank you very much for this. Thanks for letting us know about this. Could you try something for us? Oh at lest we know what caused that. No problem! This file only contains sounds for some enemies. All textures models and light edits will remain untouched. It’s strange because it is not a problem in most computers but for some reason it is for a few people. So we’ll do some research about what could cause this. It is possible you experience some other sound bug when you reach room 212 (descending ceiling and Queen’s Grail area) because I also edited the sound file for that stage. My pc uses windos xp 32 bit. . .
Hi Albert, or Cris, I installed the Castle Release and the Village Release, and I’m playing the game on Professional Mode, as soon as I use Mendes eye on the door to the Castle, the game crashes. Also, I’m using Windows 10 64 bits and I tried to fix this crash by using the 4GB patch, but now i can’t run the game cause it gives the error 0xc0000142. It happens to me the same, could you solve it? Hi Gerardo! The issue Denis was experiencing was due to files not copying over during the install, not due to the 4GB patch (that’s unrelated). Did you get the same messages as Denis when you were installing the Castle release? Hi Gerardo, the 4GB patch tool creates a backup of the original exe file. Could you switch back to that one and let me know if the issue persists? That’s very strange! I just retried applying the patch and it continues to work. Is there anyone out there who specifically is unable to start the game after applying the 4GB patch? Hi, I recently installed the pack and I’m having slowdown/choppiness issues in the village area with the crucified cop as well. This is a clean, otherwise unmodified installation of RE4 from Steam, although I did originally install it back in 2015. Hello Miguel. Do you only notice issues in this area? Which are your computer specs? Did you notice some slowdowns in that area before the installation of our textures? Just dowloaded the castle parts right now and installed them like the way you guys showed but when i run the bat file in the game folder, the bat file cant find anything. The bat and the RE4HDTEXTCASTLE are both in the game folder. Can u help me? Hi Daniel. Thanks for reaching out. What operating system are you running? Windows 10? Hey guys, might be just me but for some reason I can’t load the 4gb patch install site? That’s strange.. I’m loading it with no problem now. Could you try it again? Humm es extraño, no recuerdo otro caso similar. Qué versión del juego estás utilizando? Qué sistema operativo usas? Does somebody else here received a 0xc0000142 error when applying the 4gb patch? The 0xc0000143 error which shows up after patching the .exe with the 4GB Patch Tool only shows up in the pirate version of the game , But I’m not 100% sure. I tried it on a pirated version of the game and it didn’t work. Puede que sea ese el problema. Otro usuario ha comentado lo mismo acerca de estar usando una versión pirata. En este caso no podemos hacer nada. Todo lo el proyecto está basado en la versión oficial y legal descargada mediante Steam. Hey there 🙂 I m playing a mod called Life in Hell so a lot of itens are in diferent places and enemies drops keys and treasures so if I install this do the new files replace the itens locations frim the mod? Or theres a way to play the mod with the remaster project. I can’t install either texture update..it says 0 files copied….. I’m running window 10, I also did the method you suggested by CMD command. Also, I couldn’t find any bio4.exe..it seems I don’t have steam version game. Hello! Our project is only for RE4 UHD version of the game released in 2014. It won’t work in original PC port released in 2007. What should we do with texture pack files after applying. Delete them or let them be where they are. I would like to know if the 4gb patch only works on the original resident evil 4 of Steam? I’ve talked with people using the original disc version of UHD (not Steam, but not pirated) and they had no problem with the 4GB patch so far. But we have no enough feedback about this matter to be 100% sure about this problem. During the unzipping process I get a message saying that “44000214.pack” is broken. Is this normal? I’ve unzipped it twice and got the same message both times. Is this something that will cause me game to crash? Hola que tal amigos, primero que nada tuve el mismo error con el patch tool, asi que restaure el bio4.exe que viene con el juego pirata para dejarlo crackeado, pase algunas partes del 3-1 hasta el 3-5 usando las texturas originales del juego que ves en las opciones de video, una vez que llegaba a las maquinas de escribir guardaba el juego y volvia a reiniciarlo para disfrutas las texturas en HD, cada vez que aparecia el error yo ya tenia el juego guardado para no repetir mucho la accion ! Did you use the 4GB tool at the top of this troubleshooting page? I had the exact same issue, and using that fixed it. I know others had crashes in that area using a cracked RE4 and not the official Steam version (caused as you cannot use the 4GB tool on the cracked RE4 .exe). Basically, if you can, use that tool as described above. It should fix your issue. If you have a pirated RE4, then you’ll have to buy the actual RE4 HD on Steam to use the tool. I used the 4GB tool, and I had more than one bio4.exe.Backup file. The game is a positive, or a crash. Consult the 4GB tool for the correct use of the method. Please help, I Downloaded the Village textures and i get the error message: “Error: Corrupted Header is found”…… I dont find the bat file! Could you re-download the files? Or unpack them (using WINRAR) with admin privileges? The bat file should be there, so something was wrong during the download or the extraction process. Hello, I installed the RELEASE3 projects.But when I use Ada to play.There are some error open on the item examine : when I choose language in Chines(Tradition),the examine description is garbled.Furthermore,when play Ada examine the weapon Rifle(and combine the scope),the game would crash and immediately close the game(Chinese(Tradition)).Please help me solve my questions,thanks! Thank you for letting us know abut this problem! 1. Are you using the Pack that was released to the public? Or are you using the Pack we sent to the donors a pair of weeks ago? Hi I just installed the Release3 project and applied the 4GB patch but the game won’t even start just crash to desktop. Any ideas? What if one does have a pirated version? I’m sorry to hear it! Can you confirm that this did not happen before installing our mod? Hey, the 4gb patch doesn’t seem to work for me, the game crashes on launch with the patch and I get error 0xc0000142 and it wont launch. Without the patch, the game launches fine but I crash every time I open the first door leading upto the village. Tried reloading 3 times and going back but every time I try and enter the door it crashes again. Are you using an original copy of the game? We have heard about this issue when people use the 4GB patch on a pirated version of the game. So i bought RE4 on steam recently and fought a small battle with getting it to launch (i have to use a program that downscale to 1920 in order to get the game to launch) so then i went to download a couple of mods first i downloaded this one and after installing via batch file it looked like everything worked HD everything! i was currently at the part where u discover the medallion challenge (where you see the dog for a second time) i tried to leave the area a couple of times but i got a CTD after the screen flickered purple for a brief second (i assume it was the down sampler doing of the screen effect before it CTD) note that I do have the 4gb patch installed and i tried exiting 2 different ways on that part (i believe it also was the part before the first boulder quick time event) I do own a legal copy of this game. thx for any sorta assistance! I’m sorry to hear you are having that issue! Hello, I have a problem: when I try to open install-script.bat an error message appears, it’s number is (0xc0000142). Tried replacing all the files of the mod itself, but it doesn’t help. Playing on Windows 7 and RE4 runs just fine by itself. I don’t have any mods installed. Let us know if you don’t find the answer! I’m getting the 0xc0000142 error code after applying the patch too. If I use the backup EXE, the game runs perfectly. I’m using the original Steam version of the game. Is there anything to do in this case? PS: With the HD enabled, the game crashes after a while (10 mins, tops). Without HD enabled, the game runs with no problem. That’s strange. It’s the first time we hear about someone having this kind of crashing issues with a legal copy of the game. Are you sure the exe haven’t been cracked in any way before applying the 4GB patch? With the texture pack installed and the exe patched, I can’t load into the game. Whether it’s a new game or an old save, I can’t load into the game without it crashing. When I try to run the script to install the files, I get a “Cannot find the file / path specified” error. Dosyaları yüklemek için betiği çalıştırmayı denediğimde, “Dosya / yol belirtilen dosya bulunamadı” hatası alıyorum. I could not find it in the rar. Does it look exactly like this: http://www.re4hd.com/wp-content/uploads/2018/07/01.png ? Do you have a “BIO4” folder there? You have to install the original game first. Hi where can I download original game ? Have you applied the 4GB patch? Does it crash every time after the second giant? Or just sometimes? Hello, guys you are awesome, this mod is almost perfect, but i noticed a strange event. On chapter 3-3, there´s a room that have 5000 Pesetas,a snake, and some other items (before the fight with the second garrador), there´s two novistators that don´t exists on the vanilla game. That’s the reason for the hole in the floor of that room – a pair of Novistadors escaped from the sewers. I am impress with the work your have,congratulations!! Did you apply the 4GBpatch? Which patch should I install first? The 4gb one or the latest realease patch? On the most recent release and applied the patch. Game runs beautifully. But occasionally when I pick up an item or close a menu, the frame rate plummets. Going in and out of the menu two or three times resolves the issue but it inevitably returns as I continue to play. Has anybody else experienced this? Thanks for the feedback. It’s really an interesting and weird issue. It would be nice to know if somebody else is experiencing it. Did this issuse happen before installing the HD pack? It sounds like you are using a cracked/pirated version of the game. Is that the case? I don’t see a big improvement in textures like I saw in a twitch stream of somebody playing with the HD texture mod. 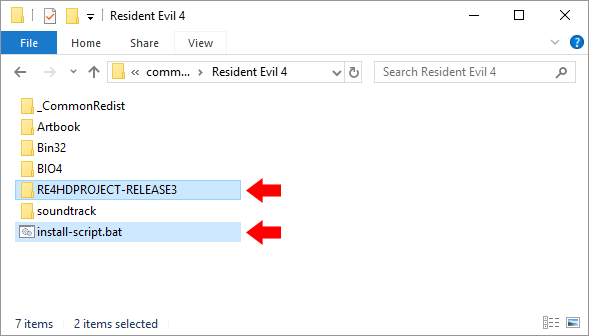 Are you supposed to have a RE4HDPROJECT-RELEASE3 directory in the steam/Resident Evil 4 directory after you patch it? That directory is not necessary after the installation process is completed. Did you follow the instructions step by step? Did you get stuck at some point? Hello, I’m using the translator so I’m sorry for the mistakes. My game fails in random parts when it goes through a checkpoint port, I already installed pacth that says it solves this problem of failing in random parts, but it did not solve, can you help me? You mean the 4GBpatch is already applied on the bio4.exe, is that correct? Could you specity which areas of the game? Did you install any other mods? How big was the downloaded pack after uncompressing it? Hey guys, please help me. Im having trouble with the sounds. Just as i started playing with the village, at the first chapter, where you encountered all the villagers and the chainsaw man, the audio is not in sync. The background is not playing well, gunshots, enemy headshots and etc are sometimes missing. I already tried, reinstalling the game and use the 4gb patch but still it doesnt work. I think i dont have any problem with my pc , I’ve got i5-7400, gtx 1060 3gb, 8gb ram, 550 psu. I use windows 10 as OS. And i use 1.0.6 version of the game. Thank you. Did it happened before installing our pack? Amazing mod, amazing job its’s so beautiful. 0xc0000142, that’s the error I’m getting when installing this patch. Look like this problem has been dated back for years. DOES ANYBODY KNOW A FIX FOR THIS ERROR? Are you using a cracked/pirated version of the game? I have a problem, I get the following error: “The system cannot find the path specified” when I run install-script. Is there any solution? Are you using RE4 UHD edition? This mod is not compatible with Ubisoft 2007 PC port. Are you following step by step all instructions? Are you using Windows 10? I you are, did you follow the Windows 10 users instructions? Good evening! I am Marcos, resident in the state of São Paulo city of Sorocaba, Brazil, since already the various communities of players of Resident Evil 4 is grateful to the work of you say in passing that an excellent work, particularly I am an admirer and fan of resident evil 4 I lost count of how many times I have closed the game on several platforms … I would like to know if there is already any voice project related to remastering in RE4 for XBOX360 especially for users of XBOX360 RGH (Reset Glitch Hack) or JTAG (Joint Test Action Group)? We know that these type of unlocking gives creators and editors the option to change and insert files … Hug and congratulations again for the work! Unfortunatelly we don’t have the knowledge to do these kind of things. Maybe (when the project is complete) someone will be able to port our edits to the console version/s. i tried the 4gb patch and the crashes didn’t stop and i also tried everything on steam from disabling the anti-virus to the touch input and keyboard disablement (yes im running windows 10) and finally to the 4gb patch but nothing worked . the game runs fine without any crashes at all without this patch. so was wondering if you guys have a solution or maybe working on a future fix???. Are you absolutelly sure you are applying the 4GBpatch to the bio4.exe file inside bin32 folder? Can you see a bio4.exe.backup inside there? And has the bio4.exe file a different “last modified date”? The issues you descrive are the typical of have not applied the patch. i read a lot about the problem and as i said b4 nothing worked but i read one thing that got my attention .. people on the old re4 had crashing problems whenever they had installed high res mods too .. and one of the members of the website posted a (already patched game.exe) it worked for people but the thing is i couldn’t find a patched bio4.exe and i’m not even sure that it would even work bcuz of steam but i don’t know.. anyways i think that i’m going to wait until the next release bcuz i think i read somewhere that you guys are not done yet…. My game don’t save anything… :c how to solve? I can’t apply the 4gb patch. It says “Couldn’t open executable”. It does create a backup of bio4.exe, though. But it doesn’t work and the game still crashes randomly. I’m in windows 10 and my copy of the game is original from Steam. Any help? Maybe you don’ty have administrator privileges or something like this… try copying the bio4.exe in some random folder C:\New folder\ for example and try patching the copied exe file and then bring it back to the bin32 folder ann overwrite the original bio4.exe file. Just a silly question: Is the game running while you try to patch the file?? Olá, ao tentar instalar o mod, está dando acesso negado! O que pode ser? I dunno if anyone else had this problem, but I’ll give a heads up for anyone having missing sound issues at the “Mike” helicopter section of the game. However they are saved in the Bio4Backup folder the installer creates so you only need to copy them back over for the sounds to work again. Hope this helps anyone having the issue. After installing the mod and the patch, plus the x86 fix I am having audio issues, specifically knife strikes and head explosions are being completely silent. Its not a game breaker obviously, but it does take some of the atmosphere out. Do you have any idea what might be causing this? I’m not sure if this happens all over the game or just in a few areas. If this happens only at the starts of the castle area and the Mike in the helicopter area then you have the solution in the penultimate point in the troubleshoot table. As fas as we know, only more VRAM (1 GB should be enough) would be needed, but we’ll do proper testing when all the project is finished and we’ll be more precise with the requirements needed. I had installed my windows 7 on drive E not on C so the files are in drive E, will the cause a problem? i tried reinstalling and installing it on different drives but the problem still remains and the files wont get copied. But it’s strange the normal method doesn’t work for you if yu are running it on a Windows 7. Do you have administrator provileges? Did you carefully follow all installation steps? please, how to solve that trouble? My PC has only 1 user, so i’m the admin. The loadings when access doors are long. Without the mod loading is almost instantaneous. Is there anything that can be done? My processor is not fast enough. Anyway, thank you very much for bringing this mod. This mod is amazing and very well done. First of all thank you for the Mod HD you provided us with, I really appreciated it. I’m having trouble getting out of the merchant near the giant fish pond. The game closes every time I try to leave. He also closed nearby. Does this patch fix this error? To install it should I just drop into the directory or should I run the file? Does this file affect anything in other games? Did this problem happened before installing our pack? If it did, then I think our pack won’t fix the problem. If you are using a legit version of the game, you could try using the 4GB patch and see if it solves the problem. Hello, first of all, sorry for bad english. And second – thanks for great mod. I have problem – it seems mod doesnt install propertly or fully, cuz i dont have HD Characters and weapons, althought door, locations, 3d object, enemies looks awesome, but Leon looks terrible, can you help me? I got a problem, I´m in chapter 3-2 and whenever I try opening a door, the game suddenly crashes. Everything was working fine. Now I can´t continue because of the bug. If you could help, that would be much appreciated. Did you apply the 4GBpacth? Did you install any other mod? Did that happened before installing our pack? I’m a computer geek.Please tell me the correct usage of the 4gb patch, whether it is installed in the c disk or in the game installation directory bio4.exe.If it is disk c, please tell me where to install it.I can’t find the path that you showed. My computer is win10 64 bit system, installation material package often flashback.Is it better to install this 4gb patch? Hey guys i downloaded the 4 gb patch and it is like 21 kb? is this right? That’s strange! Even it’s the original Stam game, did you applied some crack to the exe? For example, a crack to run the game without the need of opening Steam first. I also hope it can be solved!